You can activate and publish a website on variable devices only after you finish your project. In this article, you will learn how to make your website responsive. Enter RWD settings by selecting the cogwheel icon at the top of your website. You don't have to create a new website layout for every possible screen just now, you will have time for that later. Firstly, you should focus on computer and vertical mobile screens. If you already created RWD versions for these devices, select them from the list and save changes. After you save changes, publish your website. Check if everything displays properly by changing the size of the browser window or entering your website on a mobile device. 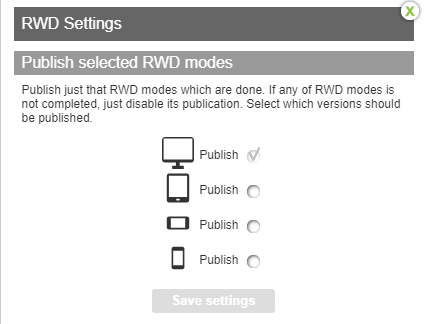 Reset all RWD settings for whole RWD mode - reset any RWD version, without creating a new project. Disable RWD edition - if you want to focus on editing website in Desktop mode, disable RWD edition first.